Today’s AM fix was USD 1,591.00, EUR 1,243.75 and GBP 1,052.39 per ounce. Yesterday’s AM fix was USD 1,597.25, EUR 1,241.35 and GBP 1,052.21 per ounce. Silver is trading at $28.35/oz, €22.27/oz and £18.84/oz. Platinum is trading at $1,576.50/oz, palladium at $756.00/oz and rhodium at $1,200/oz. Gold fell $5.30 or 0.33% and closed yesterday at $1,599.10/oz. Silver finished -0.38% with a low of $28.62. 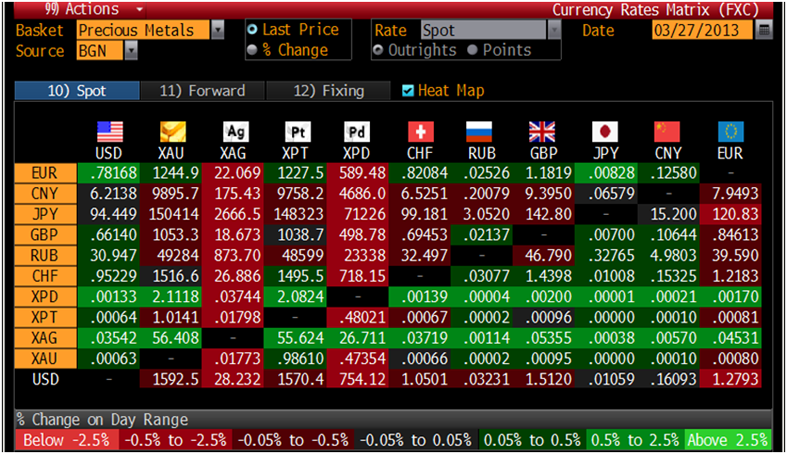 Gold is slightly lower in most major currencies this morning but is higher in euros and Swiss francs. Gold appears to be consolidating near the $1,600/oz level and worries about the euro zone's fiscal health are supporting prices as is the EU’s unprecedented expropriation of bank deposits in Cyprus. There are hopes that Cyprus will complete capital control measures today to prevent a run on the banks by rightfully nervous depositors. Russia and South Africa, which together control about 80% of the world’s reserves of platinum group metals, plan to create a trading bloc similar to OPEC to control the flow of exports according to Bloomberg.